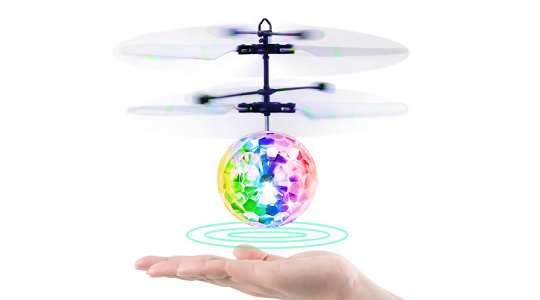 Beatheaces Flying Ball attracts kid's mind while infrared induction helicopter drone with colorful shinning led light makes the toy super special spin in small hands. Using an intelligent induction suspension flying, an induction launcher and induction receiver at the bottom of the ball makes the ball spin while power switched on. The toy will start flying in 2 to 3 seconds and you will just need to hold the ball for a while until the blades start spinning. When the toy starts spinning, it will descend at some height making it feel levitated. And when kids will put their hands underneath, it will again go up because of a smart induction function. Using a smart wireless remote control, kids can operate the toy from distance. Its a drop shaped remote using which kids can stop its function. Again a toy automatically detects the accidental hits on its way and stops its function making it safe for everyone. The overall built of the toy is made using ABS flexible plastic so that it won't hurt kids. A toy is built to be a simple and unique gadget for kids who have a keen interest in robots and drones. Even if it falls from heights, it will resist damage. So, have fun with your kids.